Today's Draw: Page of Swords from the Art of Life Tarot. Do you have what it takes to achieve your dreams? Do you have a good grasp on what is needed to achieve what you want to achieve—beyond the hard skills and desire? If the opportunity came today, would you have what you need to just jump right in and start tomorrow...or are you hoping you'll learn after the opportunity comes? 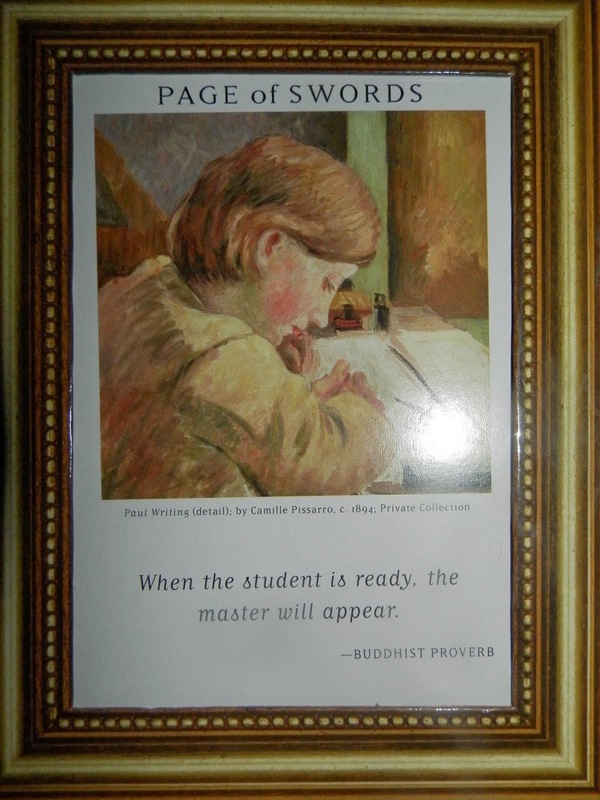 The Buddhist proverb on this card reads, "when the student is ready, the master will appear." And I would like to extend that to be "when the student is ready, the time and opportunity will also appear." This could really be about anything, because everything is a life lesson. For example, when I was ready to leave "the man" for self employment, there was no specific physical teacher that appeared, though I did pick up wisdom here and there along the way. But the opportunity came for me to stretch myself professionally. The whole thing was a learning experience. To illustrate the "when the student is ready" part, it's not enough to want something. You have to be prepared to greet the opportunity when it presents. For example, prior to becoming a freelancer, I spent 10 years working in agencies and in-house organizations. So I knew how my job was performed from every angle. I had the kind of work ethic that would have me in the office every day at 9am, whether I had assignments or not. I had a method for coping with the fear and uncertainty of the job. I understood the business behind the business. In fact, I had prepared myself in countless ways....some without even knowing why I was learning that particular skill. In other ways, however, I had to prepare myself. For example, I am not a natural networker. I'm not someone who feels comfortable putting myself out there. So I had to force myself to learn that. I had to force myself to make cold calls and go to networking events. That was all part of the learning. Oprah defines luck as "preparation meeting opportunity". It's very similar to "when the student is ready, the master will appear." But her definition points out that luck is made through effort and being ready to receive the challenge when it comes. Success is not built and retained through one-dimensional preparation, meaning it's not enough to be brilliant at what you do. There's a whole package to being successful that encompasses your temperament, personality, work ethic, charm...whatever. You may not need to have all of those things, but you need more than desire and capability to really shine. This may very well be why your less-than-capable manager is your manager. It's not just about them understanding the area of specialization, it's about rubbing elbows, making desires known, and a host of other skills they prepared themselves with so they'd be ready to meet the opportunity when it arose. That "jerk" isn't "lucky". He more than likely understands something you don't. So whatever "next level" it is that you want to get to, consider not just the knowledge you need to get there, but the mojo, the intestinal resolve and other skills needed to do the work. You might be able to pick up some as you go, but if you're waiting for the opportunity to come in order to prepare, you're likely to miss the boat. I totally love that quote. It has been coming in my life on a regular base for years now. And today we'll meet again Thanks!